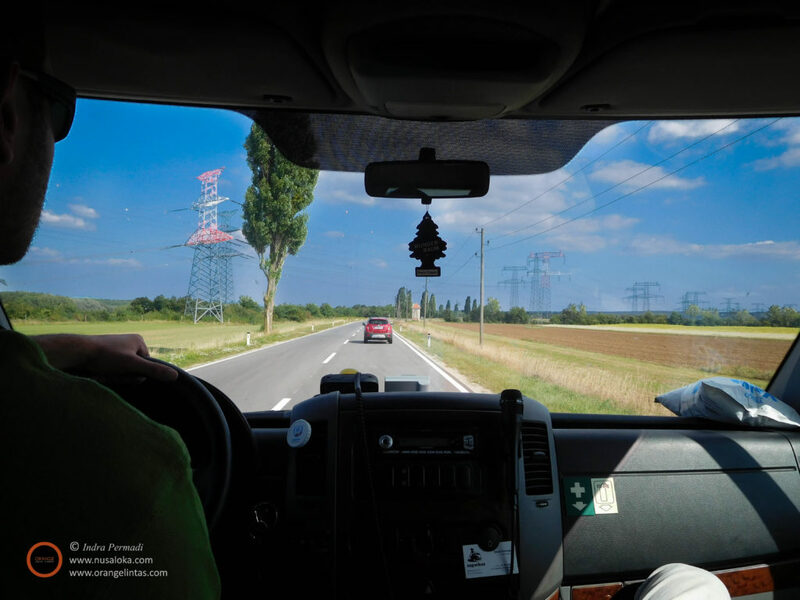 A series of flights, farms, old buildings and windmills that took us to Bratislava. It’s traveling time! 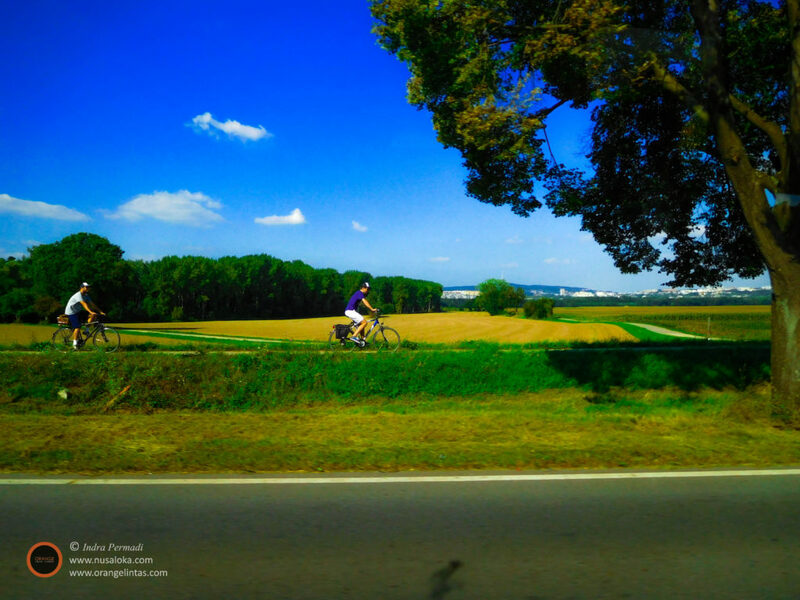 The long flight, the long wait and the not-so-long drive from Jakarta to Bratislava. Our flights departed from Jakarta’s Soekarno-Hatta International Airport. Yes, flights, not just one flight. There were 16 of us, divided into three different flights. I used Qatar Airways, via Doha, and then to Vienna, Austria. The rest of the group flew with two KLM flights, Jakarta-Amsterdam-Vienna. Vienna was our meeting point. I left Jakarta earlier than the rest and the path through Doha was shorter than through Amsterdam, so I arrived in Vienna about 5 hours earlier. One of the artists, Uyan, flew with me with Qatar, while another one, Diva, took a KLM flight that arrives 3 hours before the rest of the group. There was enough time to explore a slice of Vienna. And we did. Our three-hours sightseeing in Vienna would be a topic for another article. 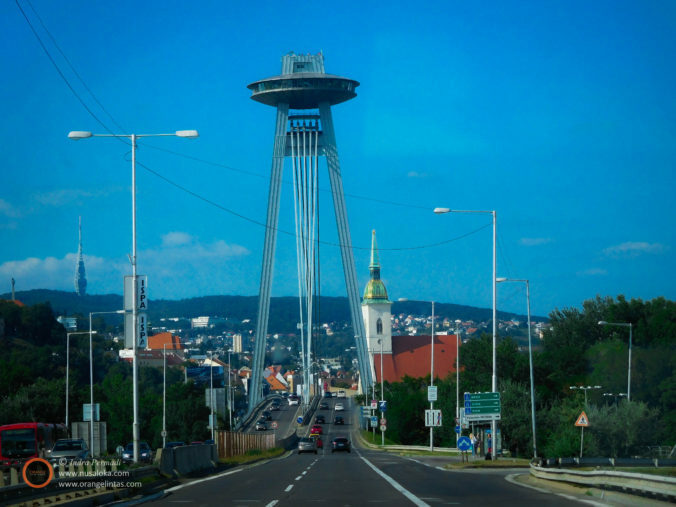 So, I’m going to jump to the main topic of this article: Bratislava. I knew that Vienna and Bratislava are close. In fact, they are referred to as twin-cities. Two cities with equal stature (both are state capitals and economic centers) that are located in close geographical proximity. 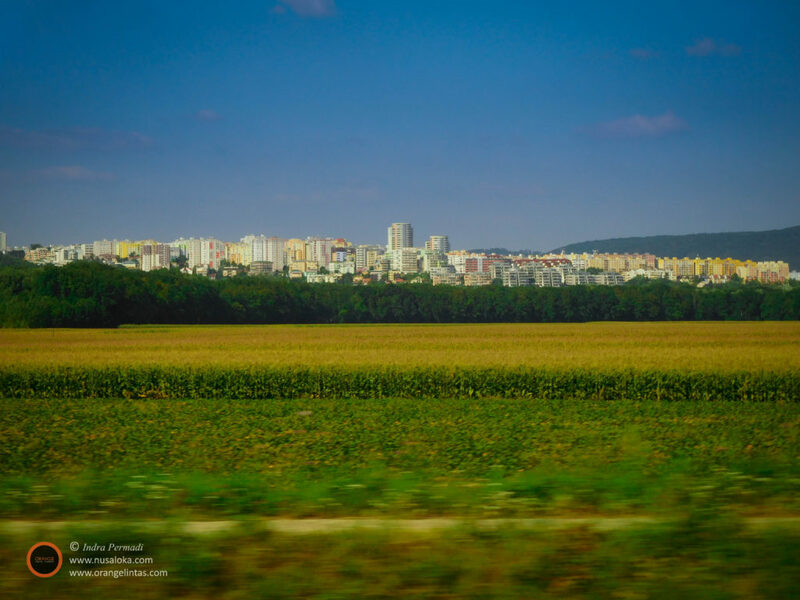 Riding in the bus from Vienna to Bratislava, I found out how close they really are. Our bus ride from the Vienna International Airport to downtown Bratislava only took about an hour. It was faster than I thought. This was a European bus, not an Indonesian intercity bus. It moved, well, elegantly. Not a single instance of high-speed zigzagging that might well be part of a movie action sequence. The road was well-paved, but surprisingly small for a road connecting two prosperous state capitals. I was expecting a busy multi-lane highway. But I loved it. To give some perspective to my fellow countrymen, this was like going from Jakarta to Bogor but avoiding the toll road and, instead, using the older Jalan Raya Bogor through the countryside. And, boy, it was a beautiful countryside. 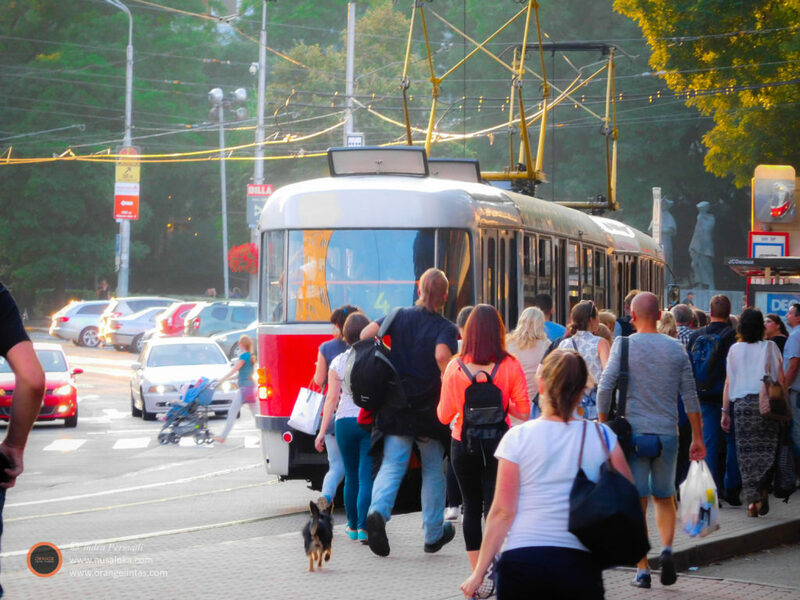 Unlike in Indonesia, we were not met by dense houses, shops, and factories. No large cargo trucks and speeding cars. No street vendors and people crossing the street. Instead, the road went through agricultural fields, patches of forest, and a couple of small towns. And parallel to our motorway, but in a safe distance from the traffic, was a bicycle track, not only inside the towns but stretches out to connect the towns. The towns were small but nice and well planned. The houses were beautiful, with small gardens or pots of plants, painted walls and maintained roofs. The kind of houses that most of us would gladly called home, but hardly exist in Indonesia. There was a slight queue when the traffic tried to pass through a small medieval gate—it reminded me how cars tried to go through Plengkung Tarunasura (Tarunasura Gate) that would take us to Wijilan, that famed culinary center of Yogyakarta. I don’t know much about agriculture to comment about all the plants we saw along the way. Maize, perhaps? Wheat? Grazing land for cattle? 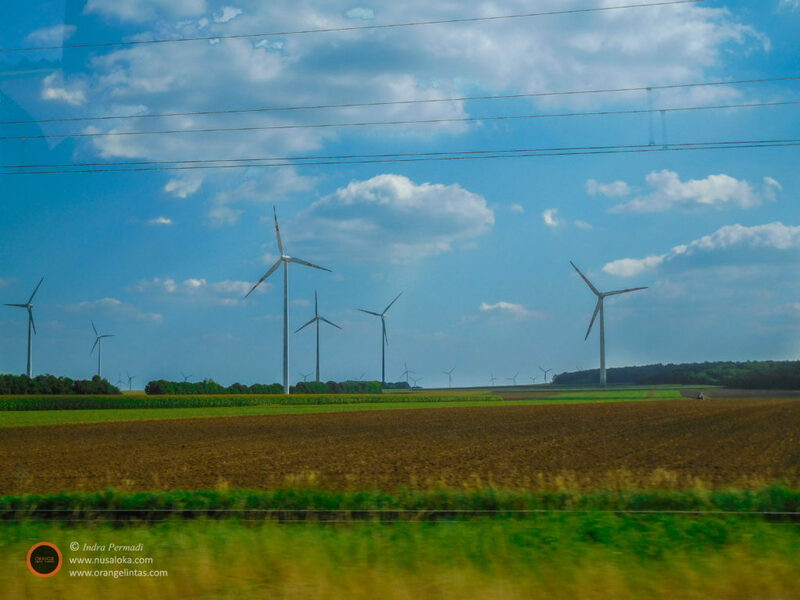 Nevertheless, it was a view to remember, especially when large wind turbines came into view. Giant figures towering over fields of green, spinning underneath blue sky and white clouds. Slowly the view of a larger city appear in the horizon. We’re closing in on Bratislava. Its famous castle can be seen from a distance. 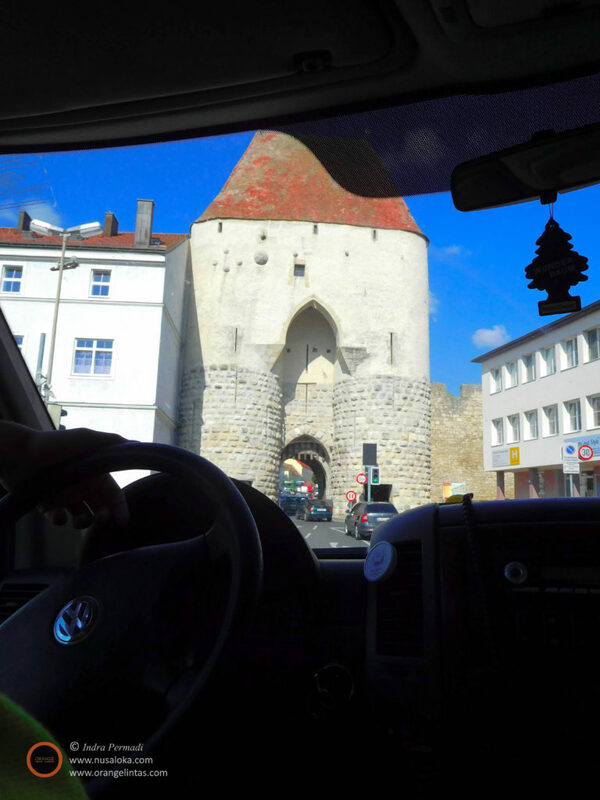 Before long, we entered Bratislava. We knew this because we passed the famous Most SNP (SNP Bridge, better known as the UFO bridge). Other than that, there wasn’t any obvious sign that we’ve crossed an international border. There was no border check, no big welcome sign or gate that we would see when crossing from one “kabupaten” or province to another. I was expecting something more, after all this border is not a river, hilly terrain, or forest—it is the capital of a sovereign country. Considering that this border was the physical form of the Iron Curtain that used to divide Europe, I originally hoped to see something. I guess the Schengen has wiped all remains of the Curtain. We entered the city. 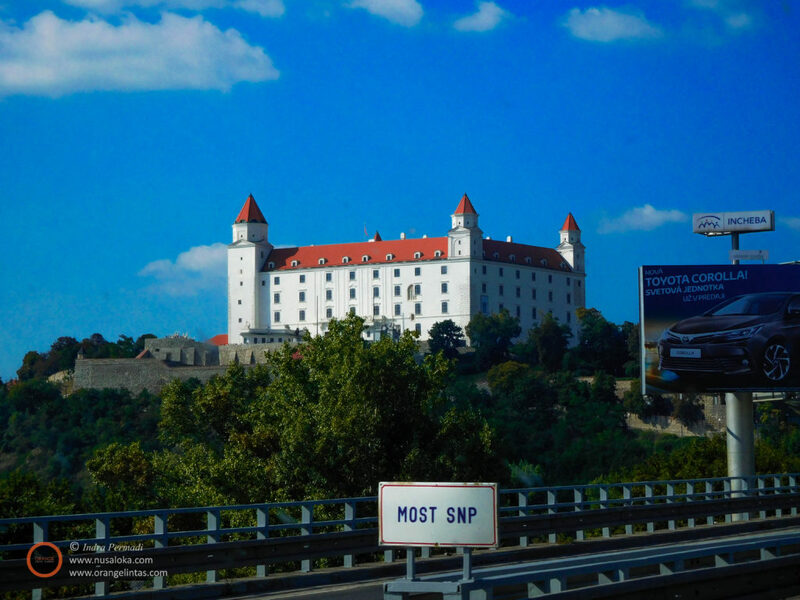 We passed highways, billboards and tramlines that showed the prosperity of the modern Slovakian economy. 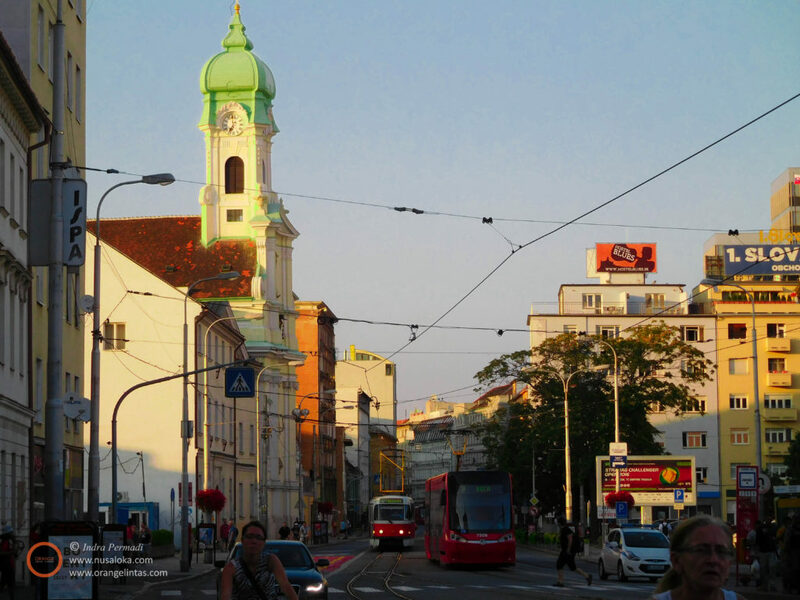 As we moved closer to its city center, we saw church spires and apartments, with architectural styles that represent the many phases of the city’s long history. The later part of that day was spent to settle down in our rooms, meet up with people from the Embassy, and a visit to the City Center where our group would perform on the next day. We’ve met our Ambassador there. He is a good man. He looked sturdy with a friendly attitude. Every embassy personnel that we met were very friendly and helpful. That night, they guided us through the streets of the Old City to a nice Asian food restaurant. A good dinner after a long flight followed by a good night sleep to build our strength. We stayed in a hostel. Yeah, not Four Seasons or a Hilton. We’re not hip-hip artists, we’re just a group of traditional dancers from Bandung. As we would discover on the next few days, this low-budget accommodation was quite useful for our cultural mission. Bratislava has welcomed us with kindness. We should repay that in kind with a terrific performance.